The land of sheep and song hosts Wonderwool at the Royal Welsh Showground in Builth Wells. Chrissie Menzies and her team work so hard to put on a show that is joy to attend. 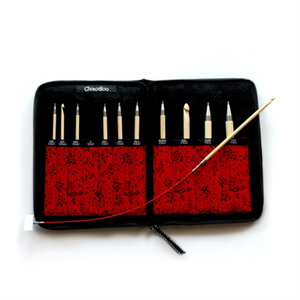 Released at the beginning of April, these interchangable Tunisian Crochet hooks bring you the quality and gorgeousness that you expect from Chiaogoo. We'll also be bringing a great selection of yarns, patterns and a comprehensive range of Chiaogoo Needles. Come and see us in stand J1 and smoosh your way to knitting luxury. Wonderwool is a chance to enjoy a fantastic range of Welsh and British artisan products and an opportunity to meet the wonderful people who made them. A great family day out with hands-on woolschool workshops and events showcasing the best in Welsh and British wool and natural fibres.